OUR ONLINE CATALOG and this reverse paint art deco snuff bottle page serve as a cross-section of our China exports. Greater variety is available. Email us a photo example of what you seek. Export prices often change. All are re confirmed after your inquiry. You will be emailed a pro-forma invoice offer. This is a rendition of the self-portrait by deLempicka, the queen of art deco painting, sitting in her 1925 Bugatti. Yes, as has been pointed out, a Bugatti was never made with a left-hand drive. Maybe a mirror was used for the self-portrait? Jade-green glass stopper, bone spoon. Art Deco era lady, boldly smoking a cigarette in her negligee. She is looking into a dresser mirror on one side of bottle, and applying make-up on the other. Negligee full of color. Jade-green glass stopper, bone spoon. Art Deco era lady sitting among red pillows. Trying to decide if she looks a bit inebriated, perhaps on the cough syrup so popular at the time. Close-up on one side shows her eyes closed and head off to the side. In any case, wonderful Deco bottle with all the pillows, her hair style, etc. Real flapper gal. Agate stopper, bone spoon. Rendition of two of the queen of art deco painting from the 1930's: de Lempicka. One side has two ladies in love. The reverse is that of a woman with a bed sheet provocatively draped about her. Jade-green stopper, bone spoon. Rendition of a painting by K. Sturges, from about 1924. One side shows the world traveling Art Deco woman as she peers through a window. Through the window is an Asian woman sitting in front of a vanity. Check out the art deco coat! The artist painted a close-up of this avante garde 20's lady on the reverse. Jade-green stopper, bone spoon. Rendition of a art deco era fantasy Geisha. The original was painted by a non-Asian artist in the 1930's and his interpretation of the exotic East. The shadowy dragon behind her really adds mystery. Different from the normal Chinese piece. Agate stopper, bone spoon. Rendition of a piece a by art deco master M. Montedora. This one has an exotic-looking deco lady. The monkey is making her an offering. Jade-green stopper, bone spoon. Rendition of two of the queen of art deco painting from the 1930's: de Lempicka. One side has a lady playing the mandolin. The reverse is a beautiful girl that is sleeping. Jade-green stopper, bone spoon. 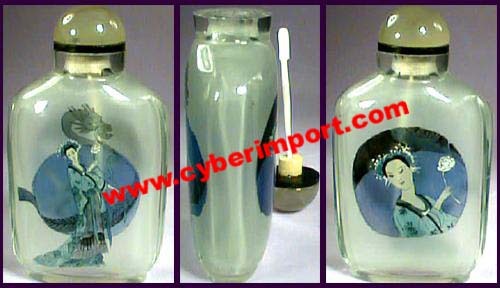 China Factory Minimum Quantity of these reverse paint art deco snuff bottle items can be negotiated with factories. Dollar Amount is often more important to smaller factories than the quantity of each piece. Minimum quantity often can be divided among several reverse paint art deco snuff bottle or stock numbers. Please inquire with us about your specific needs for smaller quantities than those listed. Smaller quantity can result in a bit higher price. Ask us for a quote. Custom Orders are possible with any of our reverse paint art deco snuff bottle products. Send us a .jpg example of what you want. If we don't have it, we can get it.